I've been a Certified Fight Director since 1997 and started doing stunts 1996. 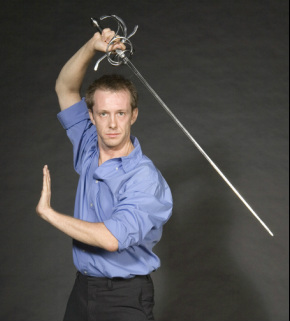 I've taught in the United States, Canada and the United Kingdom and have made a name for myself as a falling specialist, having codified my own system, and as a master of hand to hand. I've taught a range of age levels and have choreographed kids in a bear and pillow fight to the sword work for the last American production of George Stiles Three Musketeers. Working on two productions that are filmed on Green Screen: Sissyman and Trip to the Moon. I'm enjoying the way my brain has to work around problem differently. Filmed a short "Hammurabi" and a web series "Wonder" for the same brilliant director Lee Ann Hoover. A pleasure to work with her and would do so again in a heartbeat. Came in for a day to help with some stunts for the web series "We the Internet." My work is in episode A Congressional (Infighting) Christmas Carol but check out their channel if you are in the mood for a laugh. "The Time Convention" will be filming in Georgia but has been delayed to raise a little more capital. "Scarefest" is now in post production, my first horror film. Not for nothin', horror films are a heck of a good time to shoot. "The House that Jack Built" received great acclaim last year and we hope to see it continue do well. The film won a Best Picture, Best Feature, Best Screen Play, Audience Favorite and 2 Best Director awards at various Film Festivals around the country just to name a few.